The Great Leather Theater: Sbek Thom - Site de soundsofangkor ! Preah Ream. 6th century. Origiin: Angkor Borei, Takeo province. National Museum of Cambodia. 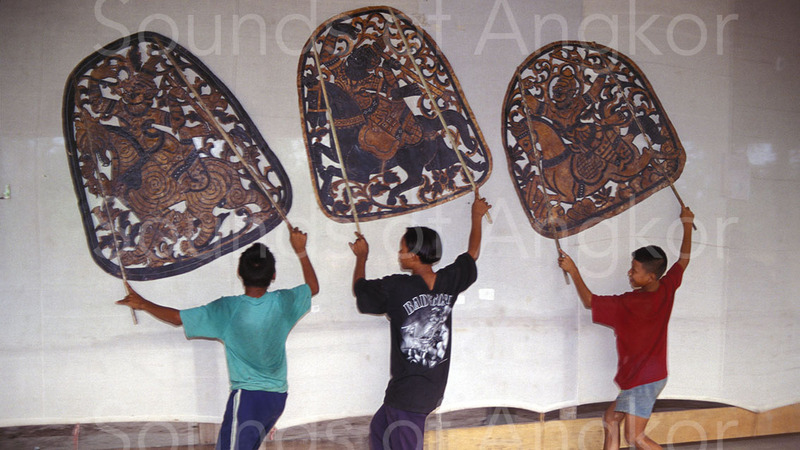 The term Sbek Thom (pronounced sbaek thom), is the largest shadow theater in Cambodia. Another one, still in use, is the Sbek Touch. The respective literal translations are "Large Leather" and "Small Leather". One and the other are differentiated, at first glance, by the size of their screen and the dimension of the leather figures. The first one shows large fixed figures, while the second shows small articulated figurines. At the second approach, the first one exclusively features the Reamker, Khmer version of the Indian Rāmāyana of Valmiki, and the second, popular stories, stories and, anecdotally, extracts from the Reamker. The historiographic sources of Sbek Thom are rare. To go back in time, we first have to look for the traces of the Rāmāyana (Reamker) and its characters. The central character of the Rāmāyana is Prince Rāma (Ream), one of the avatars of the Hindu god Vishnu, who calls the Rāmāyana (Reamker). We mention here the two terms, Rāmāyana and Reamker, because the oldest inscription we know in Cambodia (K. 359, Veal Kanteal) dates from the 6th century and mentions the term Rāmāyana, not Reamker. On the iconographic level, the oldest representation of this divine personage dates from the same period. It comes from Angkor Borei in Takeo province. The climax of this fireworks iconography dedicated to the Reamker is located in Angkor Wat. But what are the sources attesting to the ancient existence of Sbek Thom? 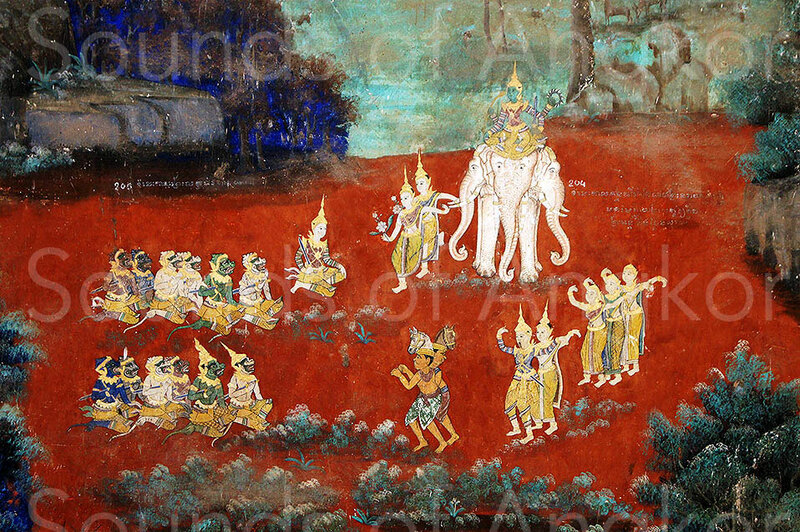 The author also points out that the literal translation of the full name of this art form, namely “Robam Nang Sbek Thom” ie “dance-of-the-great-leather-figures”, does not relate directly to the notion of shadows. The practice, it is true, is not played with the projection of shadows in the manner of Chinese or Indonesian shadows, but with a play of contrast between light and darkness. However, the notion of ‘shadow theater’ is so deeply rooted in language habits that there is no need to question it. Translation: “With the Rāmāyana and the Purāna, he gave the entire Bhārata and he instituted the recitation every day without interruption.” (Barth 1885: 30-31, K. 359, st. IV). Translation: “May a part of this pious deed return each time to the author of the excellent deed...” (Barth 1885: 31, K. 359, St. VI). Translation: “By desiring the recitations of the Purāna, the Rāmāyana and the (Mahā)bhārata, the celestial river is issued from the peak which is that face of the king of the mountains to cleanse the sins of the world.” (Coedès 1951: 51, K. 218, st. XI). In a video made in 1992 by the French ethnomusicologist Jacques Brunet, Master Ty Chean, one of the last living masters of Sbek Thom at that time explains that he is possessed by spirits and that people come to honor them. The group to which Jacques Brunet refers in this text is that of Master Ty Chean, who died in 2000. This excerpt shows a very sensitive cultural loss. Hereafter, in order to testify to the historiography of Sbek Thom, some pictures from 1998 showing Master Ty Chean and his newly born troupe. “When I came in 1992 to make a film about the Royal Ballet with a video about the Nang Sbaek, the Fine Arts lent me the skins that I took to Siem Reap by plane a few days, the time of filming . In one week, Ty Chean assembled a troupe with the village youths, making them work five or six hours a day for an unexpected result. They danced three nights in a row for four hours each time, it was amazing because we had found the way they danced in the sixties. A real joy ! It was thanks to that week that this 'memory' could be restored." As for us, we were fortunate enough to meet Master Ty Chean in 1998 before he disappeared in 2000. 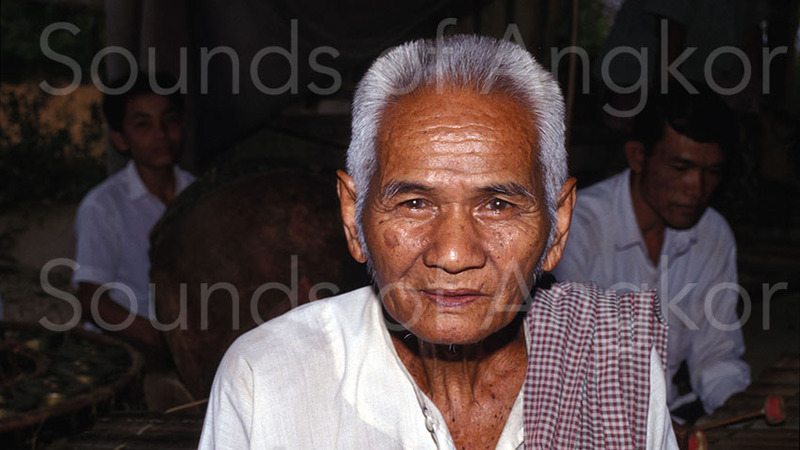 At that time, he had gathered around him, his son, his grandson and children from Siem Reap. Every day, musicians and manipulators repeated under the watchful eye and the uninterrupted presence of the master. Today, the various troupes of Cambodia are in front of the beds of tourists ignorant of both Sbek Thom and Reamker. The sessions last at most one hour. The troupe at Wat Bo Pagoda, in Siem Reap, offers one of the most iconic shows in staging. Several elements contribute to the magic of the moment: the quality of the reception of the public, the environment of the pagoda, the use of a fire fueled by coconuts and an electric light. All this creates a magic to which the spectators are particularly sensitive. The quality of the seat in front of the screen and the low number of invited spectators also contribute to create a feeling of privilege for the one who lives the moment. Ramaker ou l’amour symbolique de Ram et Seta, François Bizot. Publications de l’École française d’Extrême-Orient. Paris, 1989. French translation condensed from a Mi Chak narration recorded in 1969 who had himself learned from a manuscript found in a pagoda near the Angkor Wat temple. There are two other written but unpublished versions in Khmer; one belongs to the Ty Chean's troupe, the second to the Wat Bo's troupe, both in Siem Reap. Each of these versions is respectively known by three members of each troupe. According to the cited authors and the reference period of the texts, the spelling of the names of the characters varies. We list below the names of the names between the Reamker and the Indian Rāmāyana of Valmiki and mention their nature. Dasarath = Dasharatta, king of Ayudhyâ, father of Ream. Janak = Janaka, king of Mithilâ, adoptive father of Seda. He receives Ream to undergo the test of Shiva's bow, after which the young prince will become the husband of Seda. Kokalyâ = Kausalyâ first spouse of King Dasarath, mother of Ream. Sramut, spouse of King Dasarath, mother of Lak. Kaikesi = Kaikeyi : mother of Bhirut (= Bharata), second spouse of King Dasharath. Ream or Râm = Râma : incarnation of Vishnu, first son of Dasharath and Kausalyâ. Lak or Laks= Lakshmana : Ream's younger half-brother, his favorite. Bhirut = Bharata : son of Dasharata and Kaikesi, half-brother of Ream. Seda or Sitâ = Sitâ, spouse of Ream. Reap, Râb, Râbn, Râbanâ or Dasamukh (literal "king-to-ten-heads") = Râvana : King of the yaks (râkshasas), sovereign of Langkâ. Surpanakhar = Shûrpanakhâ : daughter of Reap. Hanumân : White monkey, General of the Army of the Monkeys, Son of the God of the Wind, Brah Bay and the Guenon, Añjan, Ream's Servant. Also named Bâyuputr. Famous for his prodigious feats, he is still today the object of an important cult throughout India. Bâlî = Vâlin : Elder brother of Sugrîb. After a fierce fight with the latter, Ream killed him by an arrow. Communication with the virtual world. In general, the musical instruments mentioned in the different versions of the story represent temporal markers. The narrator must indeed adapt the name of the musical instruments to his own time. These terms thus constitute adjustment variables between the original text of Valmiki's Rāmāyana and the Reamker. Even within the various versions of the Reamker, these elements change. Beyond the story, the musical instrument has also adapted to their time in painting and sculpture. 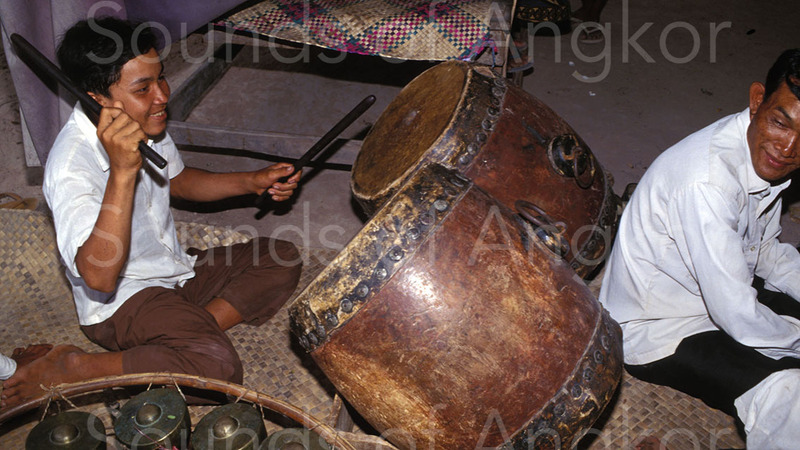 It must be borne in mind that musical instruments represent a foreign world for ordinary people. As in the world of life, they are born, transformed and die. Wars erase some of the memory. Others, acoustically more powerful, more practical, more fashionable, borrowed from other cultures, replace those in use. Then the memory of the latter disappears. The monsoon climate eventually destroys wood, bamboo, calabashes, leather, horn. The names themselves sometimes disappear from the memory of men or manuscripts on oles. What remains then as a model for the painter or the sculptor if not his own environment to draw inspiration? Individual instruments and instrumental ensembles left in testimony over time by visual artists allow to sketch a chronology of their history. The story also refers to songs, incantations and cries. Likewise, reference is made to dance, a major art form among the ancient and contemporary Khmer people: celestial, rejoicing or martial dance. Let us first list the evocations related to the sound world and to the dance in the reference works mentioned above. We classified them by genre in each of the three books consulted: war and martial parade, entertainment, funerals, distant communication, atmosphere, magic. We postpone the authors' translations with partial corrections when it seems necessary. 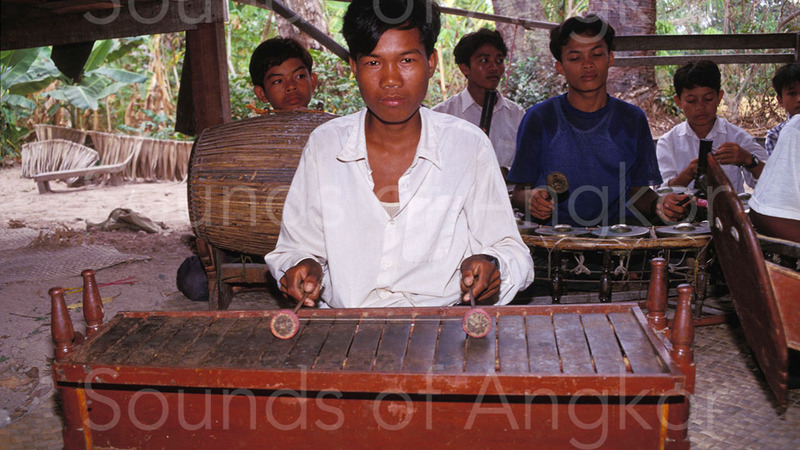 Indeed, the authors are not themselves musicologists, misinterpretations have sometimes been detected by referring to the original text in Khmer. We have also completed the translation by putting in front of the name of the organological typologies, a transliteration of the original term. May this transgression at the service of right knowledge be forgiven here! "At the sight of the carnage, Indrajit escaped on his elephant and took the appearance of the Brah Indr; celestial dancers moved with grace to its sides and gods played music with strangely beautiful accents." Royal Palace, Phnom Penh. 2. bīn bâmn, "tambourine", ramanâ, "other kind of tambourine". (Author's note). 3. The lakhon khol, or simply the khol, is the mime theater dedicated to the representation of Râmakerti. (Author's note). 4. Puppet. (According to the author's note). 5. Sung theater form of Malayo-Polynesian origin. It arrived in Cambodia by way of Siam at an unknown time. 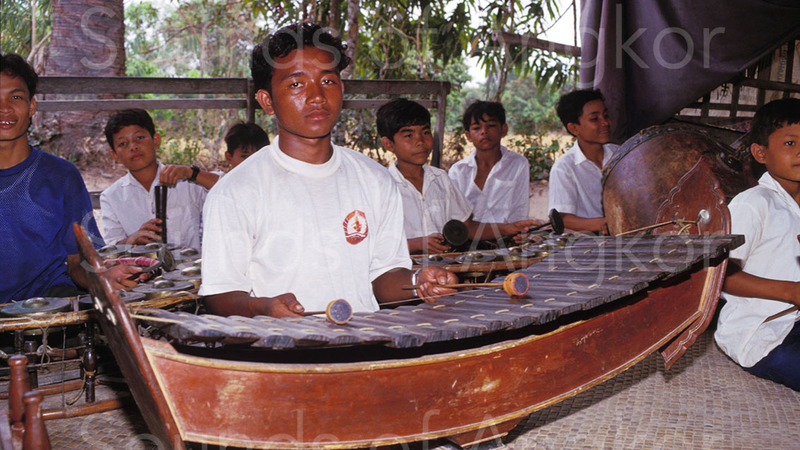 The majority of classical yīke songs are in a particular language, a mixture of Javanese or Malay, Siamese and Khmer, incomprehensible to current Khmer speakers. (Author's note). 6. An orchestral ensemble consisting of a large barrel drum, a flat gong, a bossed gong, an oboe and a bamboo flapper. (According to the author's note). 7. Texts show that the jâtrī theater was known in Cambodia in the 18th century, certainly introduced from Siam. Indeed, there is in Thailand a type of jâtrī theater, famous in the south of the country, consisting of an exclusively male troupe, whose repertoire is devoted to the history of Prince Sudhan and nymph Manorâ. (...) In Cambodia, the jâtrī theater has fallen into oblivion, but the novel Brah Sudhan is still famous there. (According to the author's note). p.271-272/1665-1671. Example of a funeral lament pronounced by Sita for her husband Rama, whom she believes to be dead. She laments thus: “O my dear friend! Why did you leave me? May I also die to unite with you (again!). Your benefits to me are inestimable, even heavier than the great ocean, thicker than the great earth: nothing can match them! Oh ! All three, exiled from the kingdom, we wandered in the forest, enduring punishments of a thousand kinds, having for their only nourishment the fruits of the trees, and dressed as ascetics! Then the demon Dasamukh took me away to take me to Langka. With ingenuity, you made a pavement, my prince, to cross the sea to your monkeys. You make war on the demons, and the annihilation to the last. Then it was our reunion, the treasure of my heart, and you brought me back to Ayudhya. A wicked and mean villain cunningly succeeded in making me draw the image of Râbanâ: it was my loss!”. What strikes at first glance is the role of certain musical instruments as tools of communication, of which the voice is of course part. This communication is exercised in these three spaces. Communicate here: Entertainment music nurtures conviviality between humans. Offered to both important characters and the public, it is one of the pleasures of life alongside dance and massage. Women in the bath imitate musical instruments; in this regard we don't know more but it could be aquatic percussion as it is still practiced in black Africa and Latin America. On several occasions, the narrative insists on the harmonious character of the music. Precious and honorary objects (umbrellas, canopies, fly-whisks ...) complete this voluptuous decorum. Communicating over there: we are referring here to martial music. Its role is threefold: to galvanize combatants, to frighten the enemy and probably also to communicate maneuvering orders. 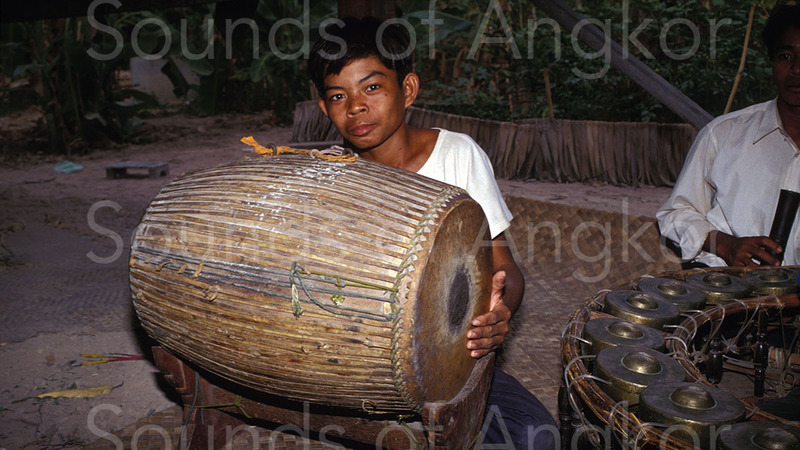 Powerful instruments like conchs, horns and gongs are clearly designated. Communicating beyond: the voice (word, song, mantra recitation, lamentation) is the appropriate communication tool to get in touch with the dead and divinities. 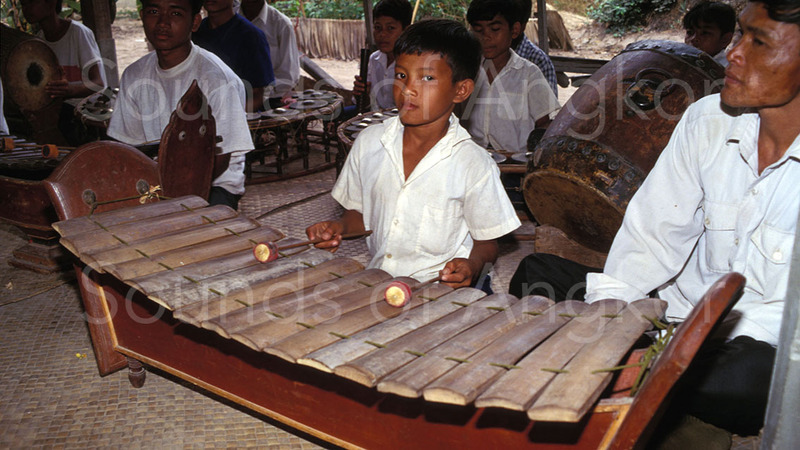 Most of the musical instruments mentioned in the stories are traceable over time in the territory of Cambodia itself. They are represented in the bas-reliefs of ancient temples, mentioned in the lapidary writings of the pre-Angkorian period or found in excavations. 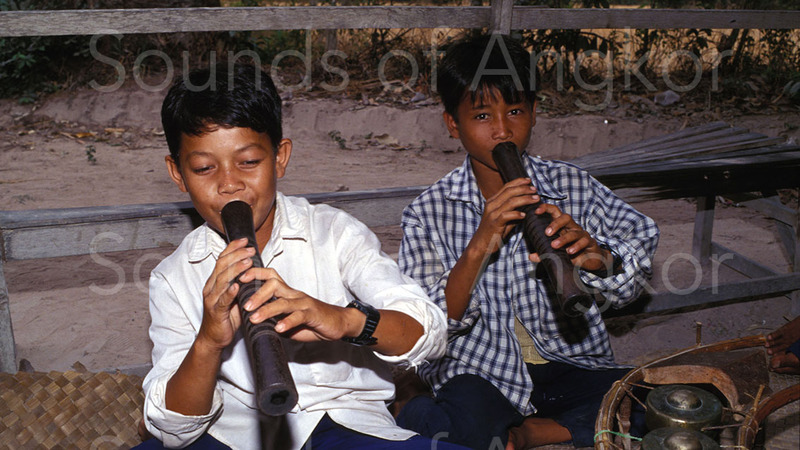 Almost all of these instruments, as well as vocal forms, remain alive in contemporary Cambodia or elsewhere in Southeast Asia. 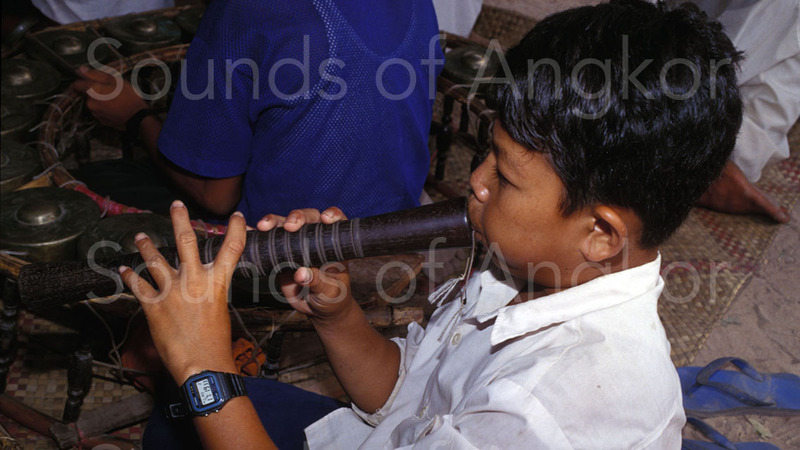 Reamker narrators have adapted the names of musical instruments and sound tools to their immediate environment. Indeed, even if the epic is old, the narrators have adapted them to their time and public. Musical instruments are technological objects that have evolved throughout history in modifications, local inventions or the adoption of exogenous objects. The Angkorian iconography offers us many paintings dealing with the Reamker. Most of the pediments of the vast temple of Angkor Wat as well as its west gallery, north wing (Battle of Langka), refer to it. Regarding the representation of the music, there are only martial orchestras in which the musicians are either men or the monkeys of the army led by Hanuman and raised by Prince Ream. Thus, referring to the preceding chapters only the rubrics ‘war and martial parade’ and ‘distant communication’ are treated in Angkorian iconography. We have dedicated a complete chapter on this topics, available in here. When we look at the souvenir market for tourists in Cambodia, part of the offer is made up of leather engravings ranging in size from the key ring to the large decorative panel, to the great figures of the Sbek Thom (though rare) and the figures of Sbek Touch. At the origin of this market offer, a man: Sery Rathana. Here is a summary of his action. You will also find below a video that summarizes his action. When Sery Rathana became an orphan at the age of nine, he sold cans and sand from the river, and cut wood so his three brothers could attend school. He has only a ninth-grade education. Later he attended the House of Peace Association, where he learned the skill of ‘skin carving art’. He was so talented that he himself became a trainer. Then, in 2002, with his own savings, Rathana opened the Little Angels Orphanage, outside the Preah Ko temple, in Siem Reap’s Bakong district. Little Angels shelters, educates and trains orphans and children from impoverished families in the craft of leather carving. Little Angels, which originally housed 5 children, now has 80, 50 of whom are orphans and 30 whose families are too poor to support them. When families approach Rathana for his help, he interviews them to see if the child qualifies to be part of his program. Because of a lack of space, the orphanage has only 10 girls. The ‘angel’, aged from 5 to 25, have a structured life like any other child. “All students have to go to school to live here,” says Rathana, which is why the students are on a rotating schedule. Thirty-five of the children will stay at the orphanage and learn how to draw or carve, while the other 45 attend. As the students receive 20% of the proceeds from the sale of their art, some choose to go to private schools. When they return from class, the ‘Angels’ can play sports, work on one of the five computers that Rathana saved up for, have free time, or do their homework. In the afternoon, English classes are held, taught by a former ‘Angels’ who is now a clergyman and a university graduate. Rathana, who receives little aid, relies on tourists to support his orphanage, and 45% of the profits from art sold are used to buy supplies to make more art and continue the adventure. In this video, discover how cowhides are prepared for Sbek Thom's, Sbek Touch or tourists' souvenirs. In this video, discover how Sery Rathana has been organizing since 2002 to teach engraving to orphans and poor children. What future for the Sbek Thom? The disinterest of the Khmers for Sbek Thom is linked to the loss of meaning. We have seen that in the sixth century, according to the inscription K. 359 of Veal Kanteal, reading or listening to the text of the Rāmāyana had purifying virtues and allowed to acquire merits. We also understood that the Sbek Thom was borrowed magic at all stages of his life (manufacture of leather figures, ceremonies prior to performances, possession of master figures by spirits). All these ingredients remain in Cambodia in various Buddhist and animist practices. The Buddhist texts in pali are virtuous and / or magical; possession remains a social component through arak ceremonies where medium-exorcists are possessed and consulted by the entourage during specific ceremonies. The ceremonies prior to each performance of music, theater or dance are unavoidable. Important homage ceremonies to the living and deceased masters (sampeah kru) continue to be performed outside performances by artistic troupes, in all disciplines. All of these rituals and beliefs are therefore an integral part of Khmer culture. So why are the Khmer themselves not interested in Sbek Thom? We propose to engage with the leaders of the main Sbek Thom troupes and the Buddhist authorities to determine if the text of the Reamker and, in its wake, the Sbek Thom, could be reborn from the ashes. Recall here that the Rāmāyana (Reamker) is a virtuous text that has shaped Khmer society for nearly a millennium and a half. So why should all this stop? We know that the Sbek Thom is in competition with the Sbek Touch, although both have had different roles in the past. The latter is obviously more popular and directly understandable by the masses. It is an easily accessible entertainment that is not bound to deep beliefs from the public's point of view. It must of course be admitted that the maintenance of a shadow theater troupe has a cost that neither the people nor the Buddhist institutions necessarily wish to assume. And even if they wish, the acquisition of know-how takes many years and requires a lot of energy. But money is not lacking, even in Cambodia. Rich patrons spend money to build pagodas and maintain monastic communities. So why not Sbek Thom's troupes? The future of Sbek Thom can only be achieved by reactivating beliefs with the support of the Buddhist authorities. In Siem Reap, Bambu Stage's shadow theater troupe has been innovating since 2013. An international and Cambodian team has created several shows mixing various artistic know-how (Sbek Thom, Sbek Touch, shadow theater itself with live characters and artifacts evolving at varying distances from the screen, theatrical play in front of the screen) and different technologies (lighting, video projection, subtitling). The other peculiarity of this innovative form is to address both a local and international audience (Khmer subtitled and English language). In the philosophy of Bambu Stage, an art form that addresses only a foreign clientele leads to the destruction of the local culture.